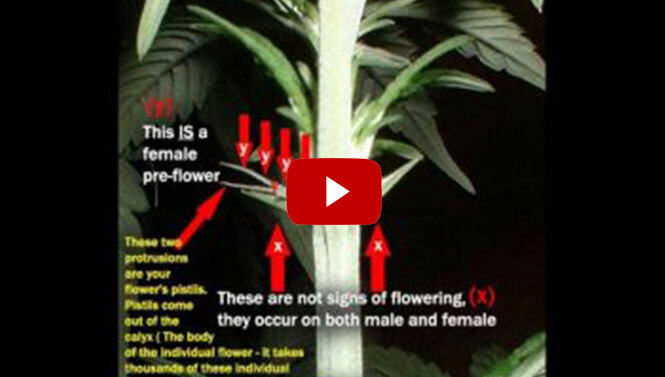 Need to know how to tell the difference between a male and female marijuana plant? Its quite easy usually between five days and two weeks into flowering you will begin to see a pair of tubular nodes. Hopefully they will have white hairs protruding from them as this denotes a female plant. these little hairs are known as pistils, and they are the first sign that your plant is flowering, and is female. Were as male plants have the “ball on a stick” appearance, if you look closely you can see it really does look like the plant has balls. They are obviously quite different from the flowering female pistils. Be sure to check out more on our How To videos.